Apologies if already suggested, but this seemed to me a nice way of showing those long samples and matching up notes and pattern events to them. With markers this would be even better. Appreciate though there is probably a whole bunch of discussion and visuals around this, but I couldn’t find it! One of the greatest FR here. Really like it! Block views as in note blocks? Yeah that’d be nice. It’s all about the little touches. Another little thought: the waveform in the Group would be a sum of the children tracks. I wonder how taxing it would be on the CPU to have to re-render the waveforms when something changes, I guess no different from the tape-style DAWs. Reaper does this in the folder waveform view. I really like how you simply have it as an option in the “track palette”. Making it optional is a great idea IMO. Sometimes (like in that other topic about finding the “hit point” of a sample) it would be a great thing to guide and assist you, and at other times I would rather be without all this “visual noise”. 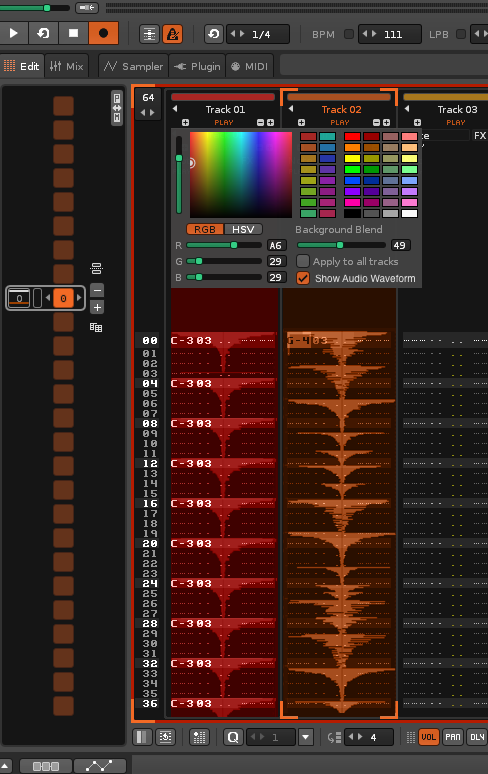 Also, I like that you’re not talking about traditional audio-tracks but rather, simply adding a visualization layer. there is probably a whole bunch of discussion and visuals around this, but I couldn’t find it! No idea exactly how taxing, but definitely more complex than a traditional DAW. I mean, enter a few 0Bxx and Uxx and you should see the change in playback direction or tempo being reflected in the waveform. Another thing to consider is whether a track more than a single note column should be visualized per column, or as a whole track? I would say per-column, simply because a fully expanded track (12 note columns) hardly can fit on a small monitor anyway. Where would you want it to go then? Streeeeeeeetching across the whole track would make it very hard to “read”. Also, if already pre rendered, there would not be the need to again render while playing -> a way of steinberg’s asio guard? Could save lot of CPU, since pre rendering can use huge buffer sizes. Yes, this feature could be intuitive of course. At least a good complement for temporary/special tasks. I also like the idea of displaying ”post-inserts-waveforms”, which I’ve earlier brought up in the sticky long thread as well. But I would vote yes only if this won’t be regarded as a replacement for a fully fledged horizontal audio-view editor (in the possible future). I’ve been working in trackers for around 20 years now, and still can’t wrap my head around a vertical audio view. Not to mention, how confused newcomers would be? Remember that not every tool/edit-view in Renoise is vertical; the Sample Editor and the Automation window to mention a few. If something is vertical, it has a good reason to be so. Moreover, I think a vertical audio-view merged with the pattern-view makes it a bit cluttered and distracting. I can imagine this being turned off/on quite frequently. Nothing wrong with that, but it’s worth to mention that a horizontal audio-view could open up for some more interesting features than a vertical. So, first of all, instead maybe the Audio-view could be merged with Automation-view. No more automation-guess work. These two views would be toggle-able of course (so the waveforms are rather transparent in Automation-view) and since it’s the same window the feature-addition wouldn’t require any further screen-space. Well, preferably, Renoise should support attachable windows and/or the ability to make this window bigger to get an overview of more than one track at a time. I also suspect that one would like to have a better overview & understanding of the song at a global level, from start to finish, where the Pattern Matrix currently fails (ZOOM IN / OUT etc). Suddenly, you can now copy & paste a single kick from pattern 10 [line 00] to pattern 231 [line 20] without any more hassle (than just for instance ALT-dragging the waveform in a second). Furthermore, I imagine the possibility to quickly manipulate a few single clap-sounds in patterns 10, 20, 30 & 40 (non-consecutive selection) simultaneously. Access the automatically created sample in the sample-tree view, for further edits. Last but not least, start your recording from any line in any pattern. TLDR; Yes, great feature suggestion but I believe the endless possibilities of a horizontal true audio-view editor shouldn’t be overlooked. Just my two cents (starting from a detuned sample hopefully :D) ! Yes. This looks like a cool visualization, but it doesn’t seem to cover anything in regards to audiotrack features (editing, comping, arming/recording…)? IF some kind of audio tracks were to be implemented, I hope it will be more than a visualization. This idea doesn’t seem to add much to the ruler already available in the sample editor. The ability to view multiple waveforms at once (on a timeline), but that’s about it. Indeed, forgot about that one. Some very nice ideas by BEEPER. Not to mention, how confused newcomers would be? I think that the idea is actually helping newcomers? Punch in a note, see the waveform appear. AHA!Add a little slide or volume command. The waveform updates. Double-AHA!! Other than that, I agree. Would like to see these things appear in the automation too, makes sense. You make me want to revisit my “stacked layout” mockup (link) and add waveforms to it. Agreed. I actually developed his audio tracks-idea in theory a bit further in this old postin the official thread regarding the subject. However, I’m aware of that it looks a bit messy and would require some additional thought/rework to make the idea shine through a bit more. There are however some users that seems to have grasped the overall idea and appreciated it. You have a point in that of course. Still, I think a vertical only option for audio tracks would probably look a bit weird to most newbies. Looks interesting, yes. I’ll hopefully get the time to read more in that thread later on. Another thought: Would it be possible to develop an audio track tool for Renoise, or would it be too advanced to make it work? It could for instance expand the automation window idea, as mentioned previously.